Rubeola is a contagious virus that we commonly know as measles. The measles are spread through infected droplets from the nose, mouth and throat. Measles can be fatal in children because their immune systems are not fully equipped to fight off the virus. Adults can also contract measles, yet with prompt diagnosis they can recover fairly quickly. You develop immunity after contracting, recovering from or becoming vaccinated for measles. One of the most common measles symptoms is a rash. A measles-related rash usually starts three to five days after exposure to the rubeola virus. You may notice large, flat blotches on your face or around your hairline first. Over the next couple of days, these blotches will start to spread down to other parts of your body. The blotches will become itchy; it's important to avoid scratching to prevent further contamination of the virus. Using a topical treatment can help to relieve itching symptoms. Another key symptom of measles is inflammation of the eyes. Because the virus begins in the nose and mouth, it is not uncommon for the virus to spread to other parts of the head. Eye infections, bloodshot eyes and sensitivity to light may occur as a result of contracting measles. As the central site of infection, a runny nose is typically inevitable with the onset of measles. You may also notice a sore throat or a recurrent dry cough. Be cautious when coughing or sneezing to prevent spreading the disease. as it is spread through fluids from the nose, mouth and throat. Approximately two to three days after exposure, you may develop white spots with bluish centers inside the mouth, usually in the inner lining of the cheek. These spots, called Koplik's spots, are an internal version of the rash experienced on the body. You might also experience some flu-like symptoms. 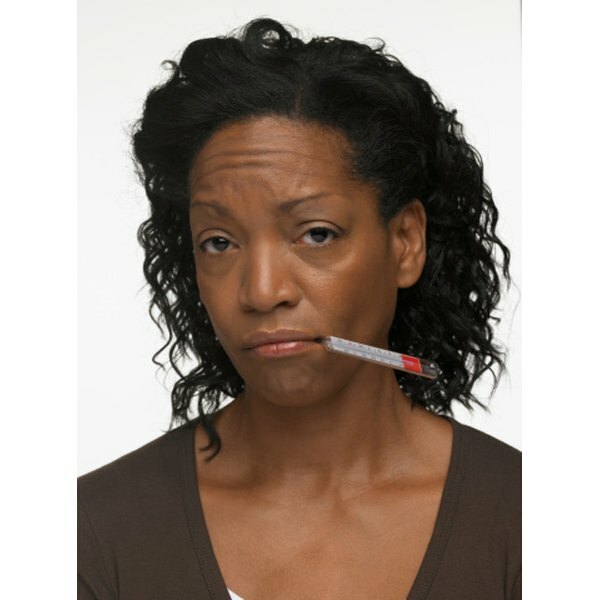 As your body begins to fight off the virus, you might develop a fever that spikes up to 104 or 105 degrees F. Fatigue and muscle aches are also common, especially after the rash develops.